Stores reference 33c/951. Late war pattern fluorescene dye pack as fitted to the 1941 pattern Mae West. It is formed of two pouches, an inner cotton one, approximately 14 x 6cm filled with fluorescene powder and sealed. This is contained within a second larger rubberized fabric pouch, approximately 19 x 11cm with webbing tapes attached at one end. The inner pouch is attached via a short string lanyard to the webbing of the outer pouch. The dye pack was placed in the pocket/flap on the lower left side of the Mae West under the serrated edging, and the webbing securely stitched to to the reinforcing tape of the pocket. 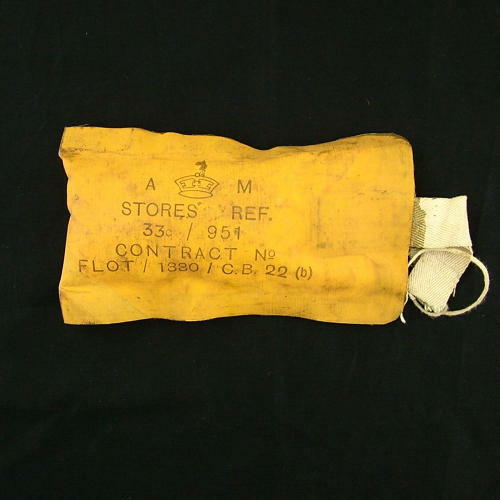 The pocket flap was then lightly tacked with locking thread such that when the webbing on the pocket flap was pulled by the airman it would rip open not only the pocket but also the rubberized pouch, thus exposing the fluorescene pouch to the water. The dye pack is complete/unused but both pouches have soiling and stains. It is clearly marked King's crown Air Ministry stamp, reference and contract details etc. Extremely rare to find. Stock code MW22594.